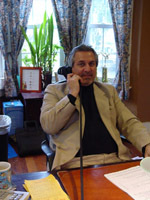 Mr. Demetriou entered the insurance industry in April, 1980, a few years after graduating from Adelphi University in Garden City, New York with a BBA (Bachelor of Business Administration) in Management. Over the next 8 ½ years, he continued to learn all aspects of the insurance industry while working for Metropolitan Life Insurance Company, Lincoln National Insurance Company and two local property/casualty agencies. During that time, he also continued his education, attaining an MBA (Master of Business Administration) from University of Baltimore in December, 1984. In September, 1988, Demetriou Insurance Services, Inc. was formed in the basement of Mr. Demetriou’s home. As a continuance of his education, in May, 1990, Mr. Demetriou received the CIC (Certified Insurance Counselor) designation. This is a five-part, five-exam program, sponsored by The National Alliance for Insurance Education & Research. In order to maintain this coveted designation, the Alliance requires every CIC to complete 20 hours of continuing education annually. Since the agency was formed, almost 25 years ago, we are proud to still be in a growth phase. We average a referral per day and are successful in writing 75% of those referrals. The agency and/or Mr. Demetriou are currently licensed in 8 states. As more business is referred to us, we will not hesitate to obtain licenses in other states. We will always attempt to find coverage for our clients and their referrals and thus, have written all types of businesses. We do, however, have some strengths in certain industries. This is a specialty of ours that has grown dramatically over the past 5 years. 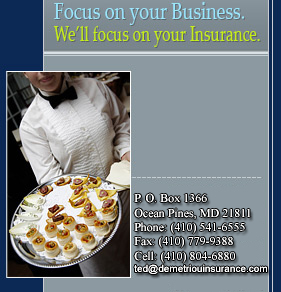 We represent four (4) insurance companies who have special programs designed exclusively for restaurants. These programs will aggressively underwrite and write fine-dining and/or family-style restaurants, as well as the pizza, sub and sandwich shops. In this industry, we are successful in writing over 90% of the restaurants that we quote. Writing these classes of business has become a favorite of ours. Only a select few insurance companies have an appetite for these types of risks. We have researched and uncovered many of those. In Washington, D. C., the dram-shop laws hold the server of alcohol responsible for the actions of someone to whom they have served alcohol. For this reason, it is very difficult and expensive to secure liquor liability in Washington, D. C. Again, we are continually looking for new companies that will entertain, underwrite and write these liquor-serving establishments. Because of these dram-shop laws, the premium can be very expensive. Therefore, we feel the need to once again go the extra mile for our clients in trying to find them affordable liquor liability coverage. We have been very successful in writing many of these establishments. This is a very limited marketplace for insurance. We know of only a few companies that will write this business, but we have secured access to virtually all of them. This industry includes busses (school or charter), van services (para-transit, airport, etc.) trucking (local, intermediate or long-haul), limousine and taxi cabs. In addition, Mr. Demetriou is the Insurance Program Manager for the Rent-A-Wreck and Priceless Car Rental Franchise System. This involves continually looking to upgrade their coverages and policies. We work together with the home office management team, including senior executives, Area Development Managers, marketing and training personnel, as well as industry-specific attorneys to give an added service to their franchisees.